It’s been months since my last blog post and I’ve been putting writing one off for several months. Last year, I had some great plans for 2016. However, things have gone awry and most plans have been shelved. More about those later. I guess the biggest news is that I’m no longer working for parkrun. Although it was a dream job at times it just didn’t work out and we parted company in early December. It was tough at first. Really tough if I’m honest (no longer working for a company I’m so passionate about and being out of work) but overall it’s been a really positive move which is something I didn’t think I’d say almost 3 months ago. The timing made things challenging. Christmas was much less enjoyable than it should have been. There were few Christmas presents to open but at least it meant less packaging to dispose of!! 😉 However, having to live off reduced monthly income (and not knowing when I’d be next paid) meant that we gave a long hard look at our outgoings and reduced them considerably. We dropped outgoings by 1/3rd at least and continue to do so. It’s amazing how much you can haemorrhage money each month without a moment’s thought. It becomes the ‘norm’ and you get used to it. We went through a process of questioning every outgoing and working out whether could get things cheaper. Ultimately that meant stopping paying for things and buying things we didn’t need and finding cheaper alternatives for the things we did. Those included phone line rental and calls, gas & electricity, insurances etc. There’s almost always a better deal than the one you’re on and it’s well worth shopping around regularly. Having some idea of what we were spending money in was a big step forward. Building a monthly and yearly budget and sticking to it has been invaluable. Another really useful thing has been Tesco Clubcard. We used to shop regularly at Tesco (Aldi is now out grocery shop of choice) and had several hundred £££s of vouchers. These were rarely used. However, we’ve now used them to pay for RAC membership, a holiday, restaurant visits, bowling and cinema trips. I’d recommend reviewing income and outgoings on a regular basis, keeping track of everything you spend and look at how you can reduce that. Losing/leaving my job was exactly the impetus we needed to get our finances in order. What could you do to trim your outgoings if you lost your job? Could you survive for 3-6 months with a vastly reduced income? As well as work, I’m investing time in learning new things. I’ve signed up to some Udemy courses and am focusing on data science and machine learning. All good stuff. Aside from work, training – my own at least – has suffered mainly due to injury. I developed Plantar Fasciitis in the Autumn last year and decided I had to stop running in order to recover a couple of months later. I should have stopped sooner of course. I’m gradually getting back into it but am unfit and have doubts over whether I’ll manage to make it around the Eastleigh 10K later this month or Southampton Half in April. My grander plans for solo at Endure 24, 2 Oceans Ultra and Tough Mudder have all been scrapped as I’m simply not sure I could run and not end up back injured. It’s not all bad news though. 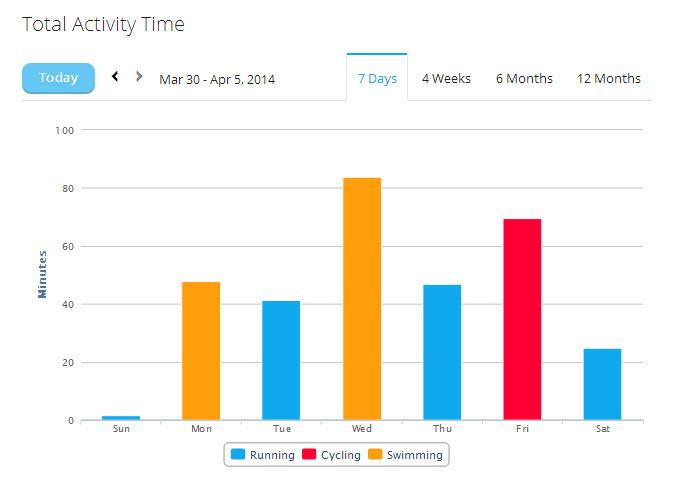 Saving money and wanted to keep reasonably fit has meant more time on the bike. I’m cycling when possible and that normally means cycling to and from Lordshill training and parkruns. I’ve also been volunteering at parkrun and junior parkrun often. In fact, I volunteered at 19 consecutive events before having a Saturday morning off and am now less than 10 events away from having volunteered at 250 parkrun events. The only other thing to mention is Run Leading and stepping this up. I’ve now been a Run Leader for over a year and really enjoy it. I’ll be attending the first weekend of the Coach in Running Fitness (CiRF) this coming weekend and will be leading some coached sessions from next week. Really looking forward to it. As an active member of Lordshill Road Runners, I’ve been participating in training sessions for several months now and have really enjoyed them. On some weeks, they are the highlight of my training week. It’s great to train with others and it’s also been a great way of making new running friends. At training, we’re indebted to those that deliver these sessions; the coaches and Run Leaders (also known as a LiRF or Leader in Running Fitness) who often put their training on hold for an evening to help others. They do so voluntarily out of the goodness of their hearts! 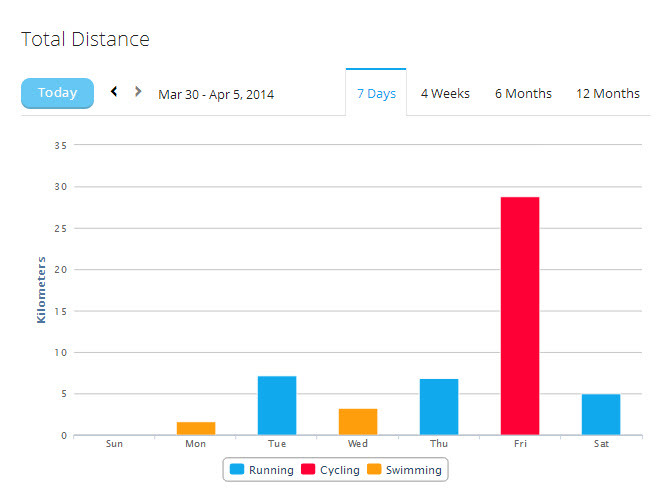 For quite some time, I’ve been thinking of training as a Run Leader but never quite committed. However, late last year I decided that I’d stop procrastinating and sign up for the next Leadership in Running Fitness course which was being held at my local sports/leisure centre – Fleming Park in Eastleigh. As my intention was to help out at club training sessions, I was fortunate enough to have the course paid for by the club. I had offered to self-fund but was grateful that the club’s coffers were bursting at the seams! From a club-perspective, I’m sure that the ideal would be to have so many coaches and Run Leaders that they can lead sessions for so many weeks and then take a few weeks off to concentrate on their own training or take some time off and chill out and I hope that this post will help encourage some club members to consider taking a LiRF course to allow this to happen. It would also be great if a few of the more experienced Run Leaders would consider taking the extra steps to become a Coach in Running Fitness. I can’t commit to leading every week – the more Run Leaders the club has, the more time Run Leaders can take time off. I don’t have enough technical knowledge to feel confident in the role – next to no technical knowledge is required to be a Run Leader. Most of it is common sense! I’m injured and can’t run – Run Leaders can lead a group from a bike or, in many sessions, from a stationary position! The course started at 9am and when I arrived at the Park Suite at Fleming Park, I was quite surprised to see about 30 chairs set up. I was expecting about 15 to be on the course but this was a big underestimate. I recognised several faces from various places. There were a handful of club members there from LRR, as well as Henry from WADAC. 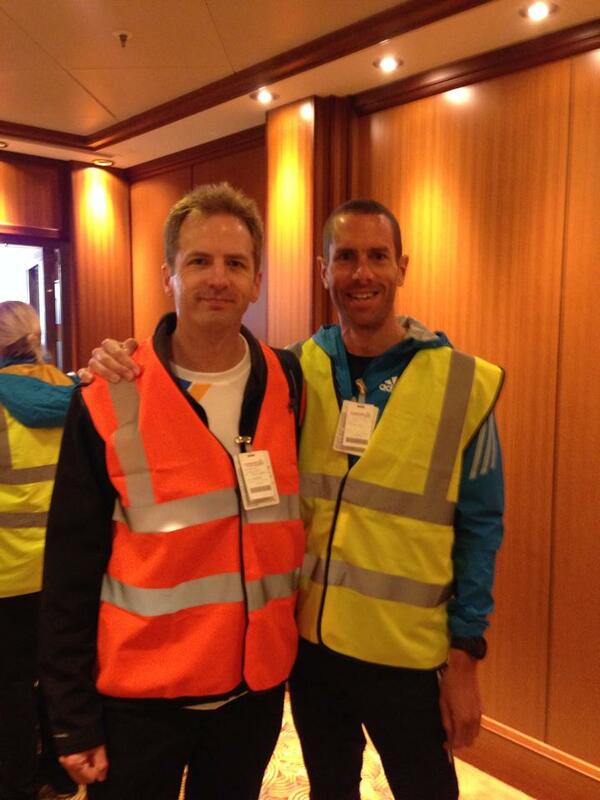 I also recognised a couple of local parkrunners and parents of children that take part in Southampton junior parkrun. The course was a mix of theory and practical and was delivered by two experienced coaches; Suzy and Beth. There was also another lady, Peggy, whose primary role appeared to be making sure that the course was delivered correctly and to appraise Suzy and Beth. The first task we had to do was to call out what we wanted to achieve from the course and these were then written on a board. After that, we had to each write down why we wanted to be a Run Leader on a post-it and affix it to a board. We then had to take someone else’s post-it and then try and find that person. This was a great way of introducing ourselves to each other. Although the LiRF role was probably introduced as a way of getting Running Groups set up in communities (as part of Run England), many clubs have chosen to get enthusiastic members trained up to help deliver their training sessions in a safe way. I’d say that a majority of those present were going to be providing the latter. Next up, we discussed the various stages of planning a training session and the importance of ongoing risk assessments and safety for participants. Next, We moved out of the conference room for our first practical which was related to the safety and organisation of the warm up for a session. Initially, the trainers gave us a warm up session and then described the approach they’d taken to make sure that we as participants understood what we had to do, that we did so safely and that the person leading the warm up was positioned well to keep an eye on those taking part in the session. As part of the warm up, we were introduced to the Endurance Technical Template which provides a few simple pointers for a good running form (imagine having a helium balloon attached to your head and that will lead to a good running form). In the warm up, we were reminded that dynamic stretching and flexibility exercises were important and that static stretches prior to activity were not considered best practice. We were also reminded that the warm up should be progressive and build up gradually to ensure that the participants were ready mentally and physically for the main part of the session. With a fair amount to take in, it was then our turn to split into small groups to deliver a warm up session to the other participants. Each time we lead such an exercise, we could add one to our tally of leader activities. After a coffee break, we covered cool down and stretches in the studio. There were about 6 different stretches covered and the method of delivering the demonstrations was interesting. It basically consisted of a brief intro to what the stretch was for, a couple of pointers for what to look out for in the stretch, a silent demo and then some open questions back to the group to make sure they understood the stretch and its benefits. Our next practical exercise was to then each deliver a stretch demo. After each, we were given feedback from the group and the trainers. Before long it was lunch-time, a chance to speak with the other participants and to look forward to the rest of the day. This may sound overwhelming but the reality was that none of the theory was very challenging and, as will the rest of the course, was delivered really well in a fun, engaging and easy-to-understand manner. As we weren’t quite sure of where we’d be delivering the session, we had to work out the main session once we got to the location where we were delivering it. Fellow LRR, Ashley, was in my group and we decided to do the main session part with an ERC member, James handling the warm up and Matt providing the cool down and stretches. Before we could do that though, we had to participate in a couple of the other group’s sessions. These were fun and gave a good opportunity to steal some good ideas and also avoid any mistakes they’d made. After each session, the groups provided feedback along with the trainer. We had 2 minutes to deliver the warm up, 4 minutes for the main session and then 2 minutes for the cool down and stretches. Clearly, a very condensed session but more than long enough to get the idea of what worked and what didn’t. 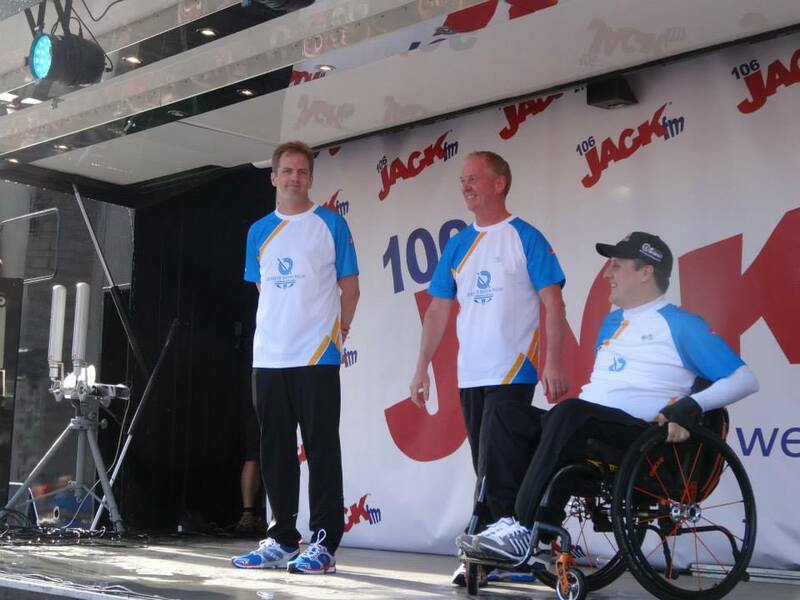 After James had delivered the warm up, it was time for Ash and I to take centre-stage! Eek! Once Matt had delivered the cool down, it was time for some feedback. That was the last practical of the day and after the last group had delivered their session, we returned to the ‘class room’ to go through a paper exercise of delivering a 6 week programme for participants working towards a 5km run. Ash and I worked together on this and worked out a detailed plan including locations, paces and session types. The last couple of sessions were related to the role of the leader in injury prevention and management and the personal development of Run Leaders. Again, these weren’t that detailed or technical and as with the rest of the course, there was a lot of audience participation and discussion. Before long, the day of training was over. We’d learned a fair amount, put lots of it into practice and had a good amount of fun along the way. The course was really well delivered throughout and a great mix of theory and practical sessions. The theory was never dull or too detailed and there were plenty of opportunities to talk about each subject and for people to share their experiences. Also, there wasn’t any individual assessment so really no pressure at all to perform. So… Now I’m a Leader In Running Fitness! I’ve already put some of what I learned on the course into practice! This evening, I attended a LRR training session and assisted experienced LiRF, Dave, by tail running in the group and by delivering the post-cool down stretches. I had anticipated that Dave would ask me if I wanted to do those and had been practicing during the day so that I didn’t look like a complete wazzock! I’m not too sure whether I managed that but would like to think that I got away with it. Having got home from my visit to Queen Elizabeth, I decided to go out for a run. The weather didn’t look too favourable but I wanted to relax and a run seemed a good solution. However, as my Garmin didn’t want to sync with any satellites, I was a little annoyed as I started my run. Before long, and with the footpod providing a ‘good enough’ measure of distance, I just ran. It rained but I didn’t really care. It was nice to get out and run. Run, ran, run, ran! Sorry! All-in-all, I ran 9.7km. I could have been a little OSD and got to 10km but wasn’t so didn’t! At about 3:15pm, I headed out to the 2nd part of my Baton Bearing duties. A reception at the Guildhall with the opportunity to watch the (crazy) cliff diving team dive from a platform about the size of a CD-case (showing my age there!) 25m high into a pool that was 3m deep. Nutters! Having arrived at Grosvenor Square to park, lost a battle with the meter, called SCC Parking Services to explain what I’d done, poured more £££s into the meter and written a note to the parking warden explaining what a chump I’d been whilst fully expecting to get a penalty notice for being a chump and then having to send proof of who I was, what I’d been doing and how I’d represented the city (perhaps exaggerating and saying I’d been one of the cliff divers), I walked to the Guildhall Square where they were setting up for the early evening’s events. On arrival, I wandered around and spotted the Marafun stall. It was unmanned and I spotted MD Chris helping to put up ‘We are England’ banners in front of the stage. We chatted for a while about this and that (not the words themselves you understand!) before I saw Craig Lintott who I introduced in my last post. This was Craig’s show and he was busy organising everyone and trying to talk to people whilst listening to others in his earpiece. After helping with a few barriers and banners, a couple of the other Baton Bearers arrived and we were escorted to the ‘Green Room’. We were the VIPs for the day along with the Baton. OK, the Baton was the VIP. Let’s call it the VIB (Very Important Baton) shall we? We were just its carriers or Bearers to give us our official title. The Green Room was in the basement of the Guildhall and was a step down from the luxury of the Queen Elizabeth. In fact, it was much more than a step down. Much much more! I sat with Annie Clewlow, the programme manager for the diving at the Quays. I’ve emailed Annie several times as Daniel has diving lessons there so it was great to out a face to the name. Annie was there with her mum and it was clear that mum was very proud. And so she should be, Annie does a great job! We spoke about lots of things including whether Tom Daley had influenced an increase in participation in diving (the answer was no) and how the 2012 Olympics most definitely had. We also spoke about Tom’s synchro partner Peter Waterfield… who had had an influence on diving participation particularly in the local area. We stayed in the Green Room (even if I continue to call it that, it won’t get any better looking so I shall start to refer to it by its proper title, the rather scruffy basement) for quite some time and weren’t really sure what we were supposed to be doing. There were refreshments on hand through (an urn, some tea bags and dried up sandwiches which could have been there from the last time to basement was painted) so we did out best to avoid those! After a while, Craig returned to tell us that the QBR team were late, most likely stuck in traffic, and we had to wait a little longer. The rest of the Baton Bearers had arrived so it was good to swap stories of our experiences with the Baton, the funny stories we had involving the Baton (not so funny to the QBR team!) and briefed Annie on all the dos and don’ts of being a Baton Bearer. The Baton arrived (or maybe it was the stand-in. You know, the one that definitely doesn’t exist!) and there were various photos taken of it with the Bearers and their assorted family members. One noticeable thing was that the QBR team were much more relaxed about how the Baton was held and handled etc and there wasn’t always someone watching its every move – it must have been the stand-in mustn’t it?! I asked one of the members of the QBR team who explained that we were in a ‘safe area’ without any media. It seemed the media were the ones that could lead to things going awry. Annie was then briefed on what she’d be doing with the Baton. It then sunk in that we’d end up on the stage. In fact, we’d all be introduced and walk individually onto the stage to lots of applause, cheers and hopefully no rotten tomatoes. Gulp! Just to add to the pressure, as I had been the first Baton Bearer of the day (aside from Iwan who had other plans for the evening), I’d be the first on the stage. GULP! I looked into the crowds and spotted Teri, Tim, Emilia and William who had a prime position. I also saw Aaron and Callum and Dave Clothier. There were other friends there too (Liz and Asa) but unfortunately I didn’t spot them. Sorry! 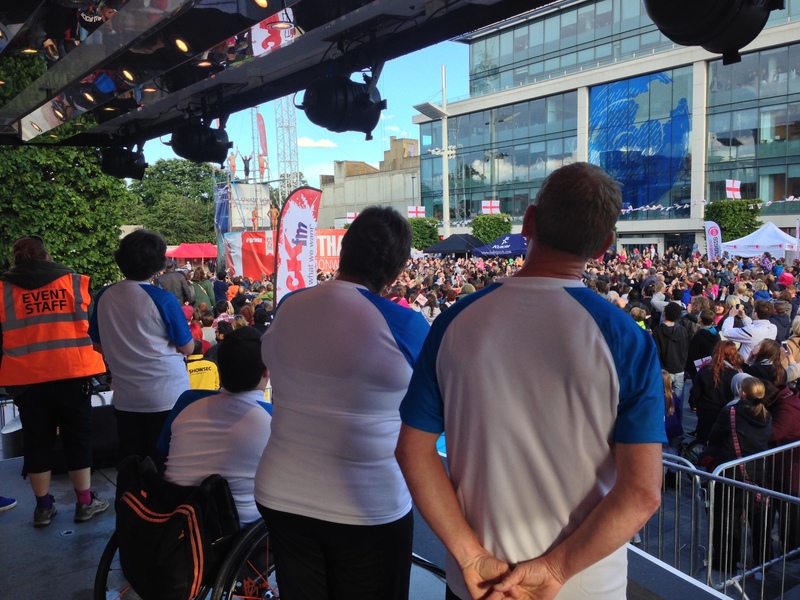 Before long, each of the other Baton Bearers joined me and we were all given a penultimate round of applause. Fortunately, the cliff divers were ready to start their set so we could rest our facial muscles and enjoy seeing them taking centre-stage while we clapped and gasped at their, um, bravado. They were crazy to do what they were doing but put on a great show and it was a fitting end to the early evening’s celebrations. Annie Clewlow, Richard, Chris Grainger and Nick… and thousands of appreciative fans… of the divers. The Baton Bearers were then given a final round of applause and we were escorted off the stage to continue to mingle with some dignitaries (also known as the group of people propping up the bar!) and the new Mayor who was doing a grand job of demolishing the trifles. Overall, the day was amazing (apart from the Garmin issues). The events were really well organised by Craig and his team. 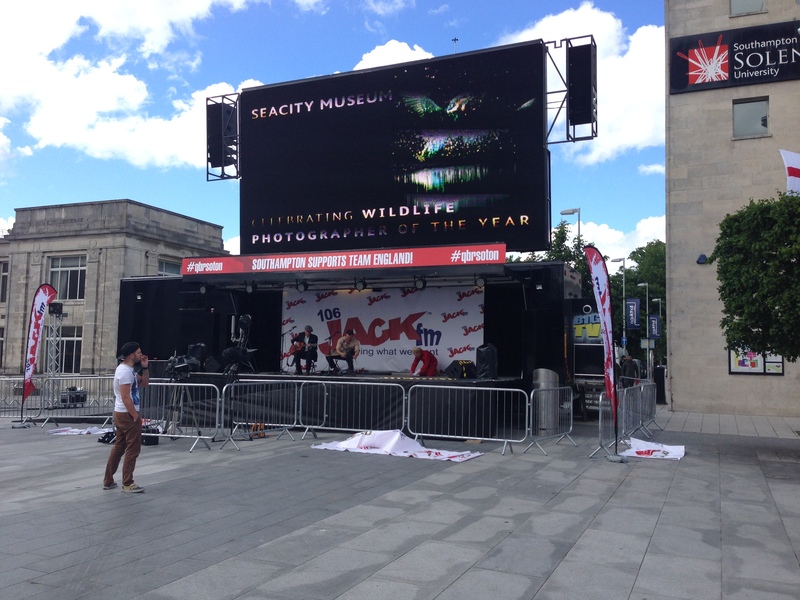 We were made to feel special and the crowds at the Guildhall seemed to be appreciative of our being there and maybe the contributions we’d all made to the local communities in terms of delivering some great sporting opportunities within Southampton. I’ve uploaded many of the photos taken on my phone. This morning, I was a Baton Bearer for the Commonwealth Games Queen’s Baton Relay. This was a great honour and came as unexpected news several weeks ago when I received an email from Southampton City Council’s Event Manager, Craig Lintott, to let me know that I’d been shortlisted. The Queen’s Baton Relay is similar to the Olympic Torch Relay in that it’s a relay of a Baton around the world. The baton itself will be traveling 190,000km before it reaches its final destination at the Commonwealth Games on the 23rd July 2014. I was nominated as a Baton Bearer by Active Nation, Sport Solent and Southampton City Council for the voluntary work I’ve done as part of setting up both Southampton parkrun and Southampton junior parkrun as well as founding and help found other local parkrun events over the last 3-4 years. In that time, with the 5 or 6 events I’ve been involved with either as Event Director or helping to set up, over 15,000 runners of all ages and abilities have run almost 440,000km! 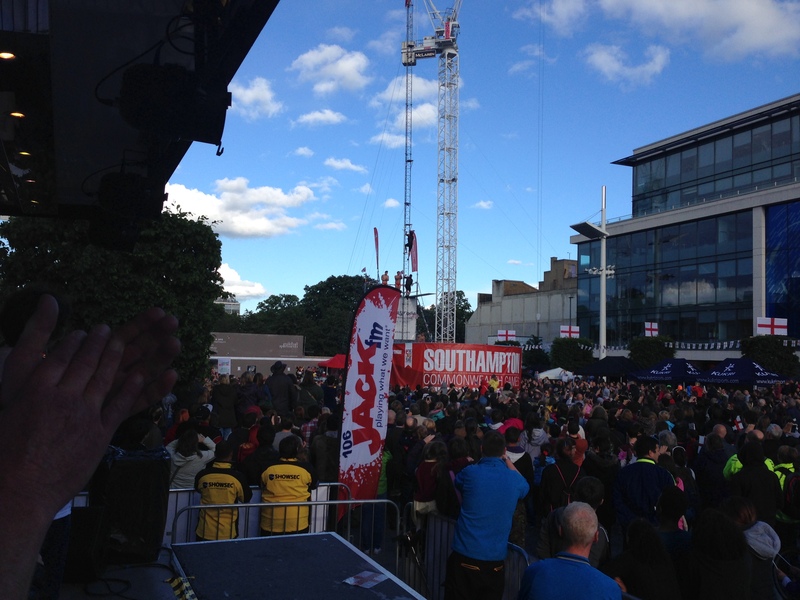 In Southampton alone with the 5km and junior 2k events, we’ve had 6092 runners completing almost 184,000km! Within a few days of receiving Craig’s email, I received official notification from the Queen’s Baton Relay (QBR) team to say that I’d been chosen as a Baton Bearer! I was a little shell-shocked and very proud. As any regular reader of my blog will know, I love parkrun and am really proud to be part of the local events and to have helped bring parkruns to several local communities. We have some great event teams and enthusiastic volunteer teams that bring these events to their participants each week and each would be very deserving of such recognition but, unfortunately, there were only 5 Baton Bearers chosen in Southampton so the best I could do was hold it on behalf of everyone that’s helped make parkrun a success locally. Anyway, back to today!! I set my alarm for 5:20am. This meant a 40-minute lie-in as normally my alarm is set for 4:40am on a Wednesday for the STC swim session at Fleming Park. 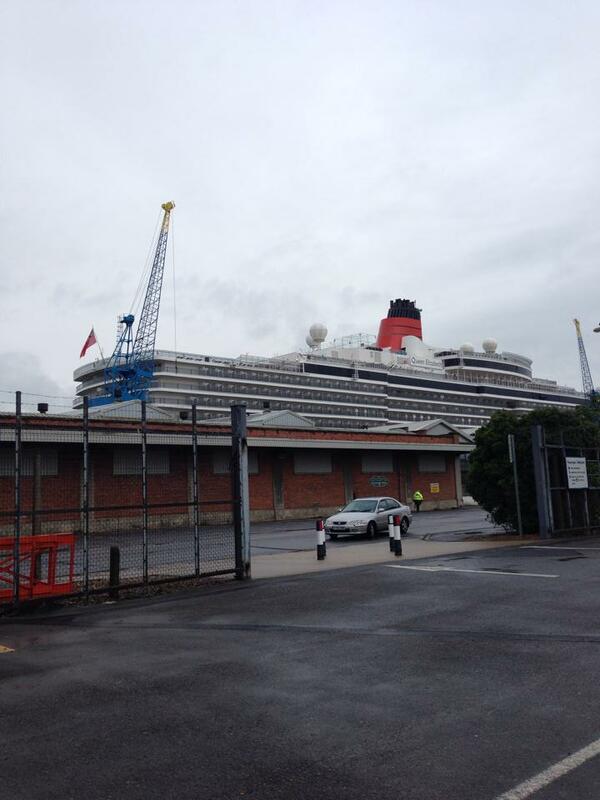 Having had breakfast and showered, I drove to Dock Gate 10 where the Queen Elizabeth Cruise Liner was berthed. Just after I’d paid the £4 for parking (first school boy error as those involved in the event didn’t need to pay! 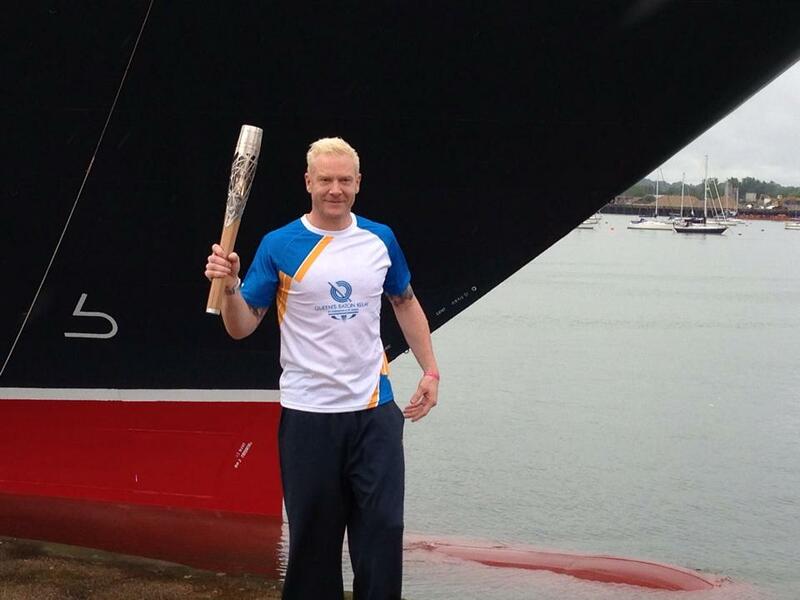 ), Iwan Thomas arrived in the car park. 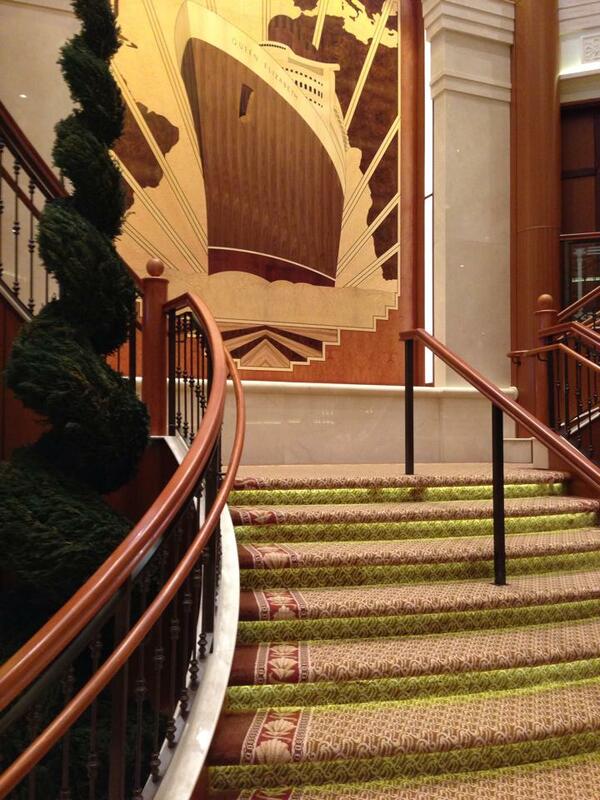 We had a brief discussion about whether we had to pay and then walked to the ‘destination’ lounge. 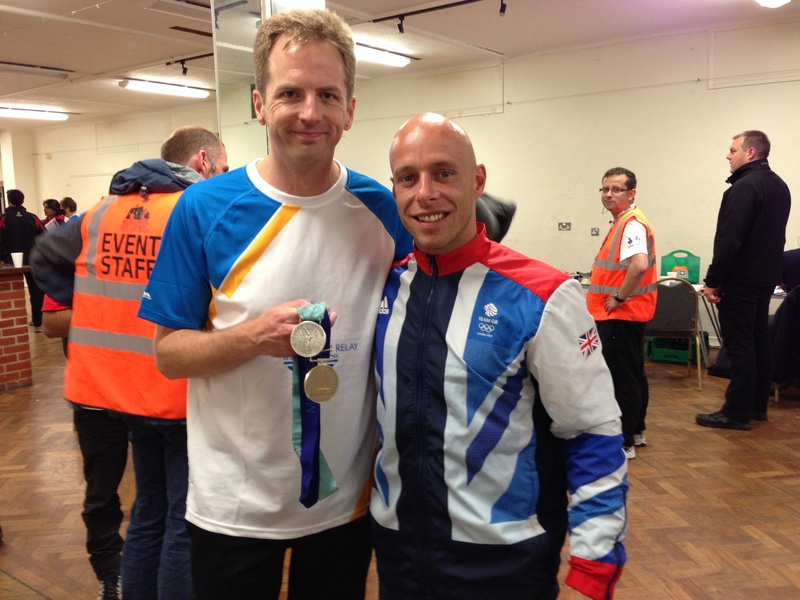 I’ve met Iwan several times at Netley Abbey parkrun as well as at Eastleigh 10K so it was good to chat with him. He’s really down to earth and easy to talk to. Our conversation covered his workload – crazy busy, the Commonwealth Games, his following it for the One Show, parkrun, his training (or lack of! ), Granny (you have to follow Iwan on Twitter to understand that but I’d recommend you don’t google it if easily offended!) and what we’d be doing with the Baton! Getting onto the ship involved airport-style security and once we’d been issued passes and surrendered our passports (we clearly weren’t going to be able to leave shore on the ship – I’m refraining from calling a boat for fear that I might upset Cunard! ), we headed up to the foyer and found some comfy seating to relax in while we waited for the Queen’s Baton Relay (QBR) and the Southampton City Council teams to arrive. As we chatted, a reporter from BBC news arrived and soon we were surrounded by people from QBR, SCC, Cunard and various media organisations. I was briefed about the baton, its journey, what it was made of, how it was made, the parchment message from the Queen inside it that won’t be opened until the opening ceremony, the gems that are unlocked by ‘solving puzzles’ and a little too much information to remember should I be asked by anyone pointing a camera or microphone at me to explain any or all of the above! At the same time, I was told that when I was holding the Baton that I should always hold it with 2 hands and not hand it to anyone. More on that later! While we were waiting, I spotted a face I recognised. It was none other than Steve Way who had been a 16-stone smoker and then had taken up running, participated in ultra-marathons and had recently qualified for the Commonwealth Games. Read more about Steve’s story in The Guardian. Before long, it was our turn to step into the spotlight and take our place whilst gripping tightly to the Baton! Iwan had several photos taken at the front of the ship – the bow as we were reminded – and was to then walk onto the ship (not a boat remember!) via the gangway (not a gangplank!) with the Baton, have the media take pictures and video footage of him, meet the crew, shake a few hands and then pass the Baton to me on (a rather slippery) deck before I walked it up to the Bridge – yes, the actual bridge of the boa.. ship! 😉 where we’d meet the Captain and then be interviewed by the assembled media; lots of media. All sounded simple enough. However, when you have the one, and only, Baton in your hands (when asked if there were spares, we were told that there weren’t but whether that’s true or not, I don’t know! ), the pressure starts to mount a little. As does the weight of the Baton. And the sweat on your palms. And the desire to deal with your itchy nose. Once Iwan had done his thing, including spending some time in front of a picture of everyone’s favourite Granny for photos – not that one Iwan – it was time for Iwan to pass the baton onto me. Gulp!! What could possibly go wrong? Well, there was the moment when I held it in one hand. That didn’t last long! Also, the time I tripped up whilst holding it – I didn’t drop it! Ah, and the time I thought I was walking alongside Iwan and said ‘I don’t suppose we should do this with the Baton’ as I passed it from hand to hand. It turned out that it wasn’t Iwan, but a member of the QBR team. Oops! Really glad that I didn’t go for the ‘throw it in the air, spin around and catch it’ routine I’d been practicing! Only kidding about the last bit. Honest! 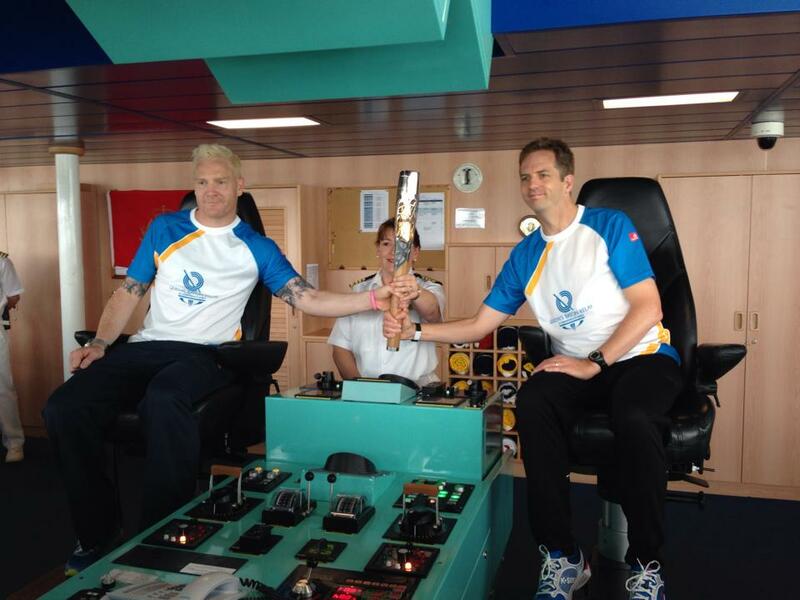 Having successfully managed to keep hold of the Baton on deck, we made our way up in a lift to the floor (?) where the bridge was. This is where I tripped going from one, er, room (?) to another. 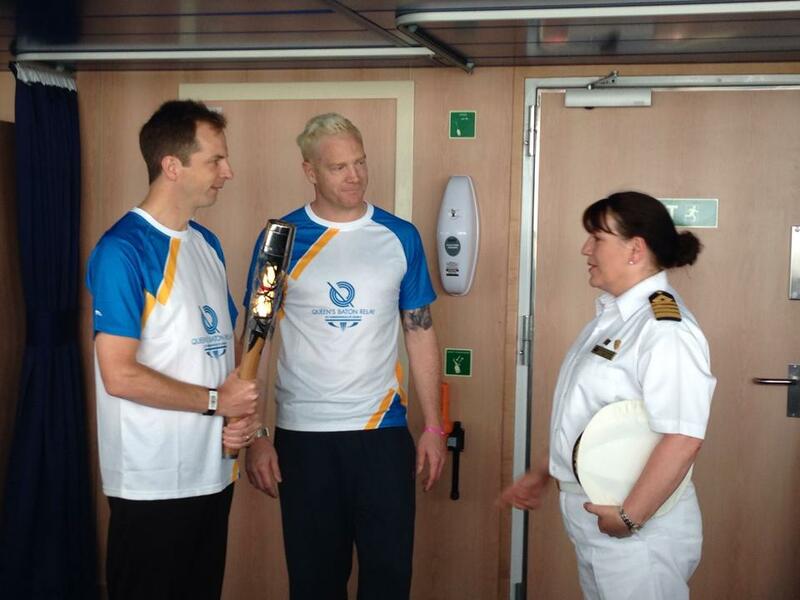 The ‘guardian of the Baton’ looked unimpressed and I was reminded that the Baton was the Queen’s Baton and not mine. I held on even tighter! We were briefed about what we were to do once we entered the bridge and then we made our way to the crowds of media to meet the Captain. I have no idea what the Captain’s name was but we exchanged pleasantries before Iwan and I signed the guest book which had been signed by the Queen herself and other royals and well known people who I can’t really recall! The fact was that Iwan and I had to sign the guestbook! The art of writing eluded me a little but I managed to scribble something barely legible and gave Iwan the pen! With his A level in Art, Iwan decided to draw a picture of the Baton! We then had photos taken with the guestbook and Iwan’s work of art and the other work of art, the Baton! There was a little time for more interviews. Those were with the Daily Echo, ITV, BBC and Cunard’s own media team. We were due to have a live broadcast but the satellite signal kept breaking up (due to a huge hulk of metal between the satellite and the OB van, namely the ship!) so we did an ‘as live’ piece instead. I did my best to make sense as I spoke and tried to remember to sounds like a worthy Baton Bearer. Not sure I managed it but you can decide once the footage airs later today! Our next mission was to sit in the Captain’s seat for some photos. Not easy whilst trying to hold the Baton with 2 hands. I had to hand it to one of the QBR team while I got settled! We had various photos taken and both resisted the rather strong temptation to press any buttons! We also had a few photos taken with the Captain. As she wasn’t an ‘designated’ Baton Bearer, she wasn’t allowed to hold the baton but was allowed to touch it. Finally, there was just time to have a few more interviews with the media before being escorted off the ship; our duties complete for the morning. This evening, we had to the Guildhall for a reception and to watch the cliff divers! More on that in a later post. 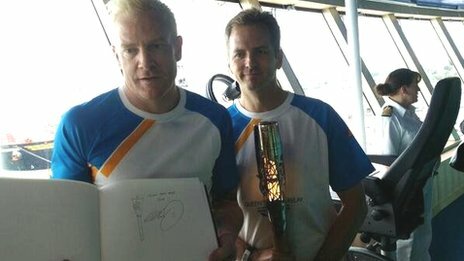 It’s been a great honour to have been chosen by Active Nation, Sport Solent and Southampton City Council as a Baton Bearer at such as special occasion and to be given the opportunity to be on board the Queen Elizabeth, visit the bridge and, most importantly, bear the Baton. I’ve joked a little about the latter but it really was a privilege being one of so few to have the honour of holding the Queen’s Baton! It’s a great day for Southampton too. A real showcase of the city’s sporting pedigree and the opportunities available to children and adults of all ages and abilities to participate in sport through the city’s excellent facilities, coaching and events. I’m also very proud to have been able to help promote parkrun and our local events to the local media. I’ll post about the early evening celebrations soon! This morning after about 16 months of my weight yoyo’ing, I finally reached a weight goal I’ve been striving for. 12 stone 5 lbs (172lbs or approximately 78kg). Several years back, I lost about 4 stone using Weight Watchers and that had been the weight I got down to then, although, that was without the benefit of exercise. In the last month, I’ve lost 10lbs without trying too hard. 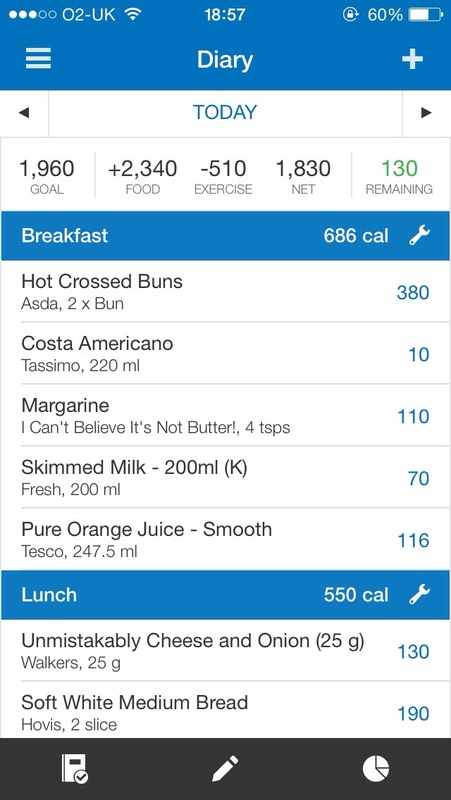 I’ve not increased my training but have counted every calorie eaten and burned using the amazing MyFitnessPal app. 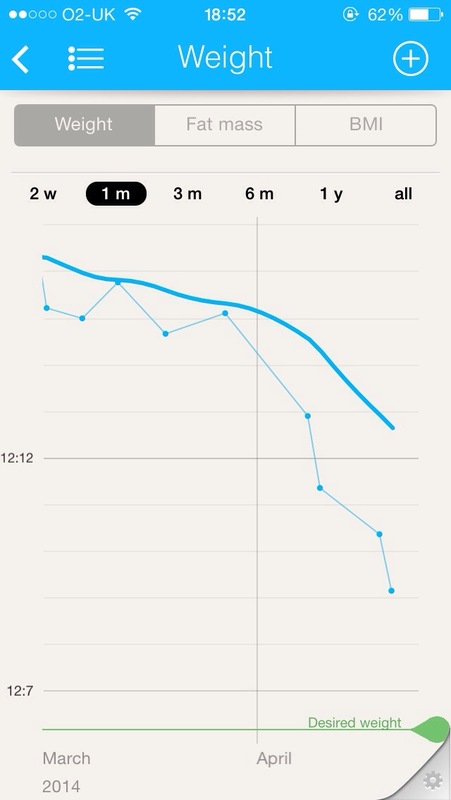 This app is by far the best calorie tracking/weight loss app I’ve ever used and, believe me, I’ve tried a few. 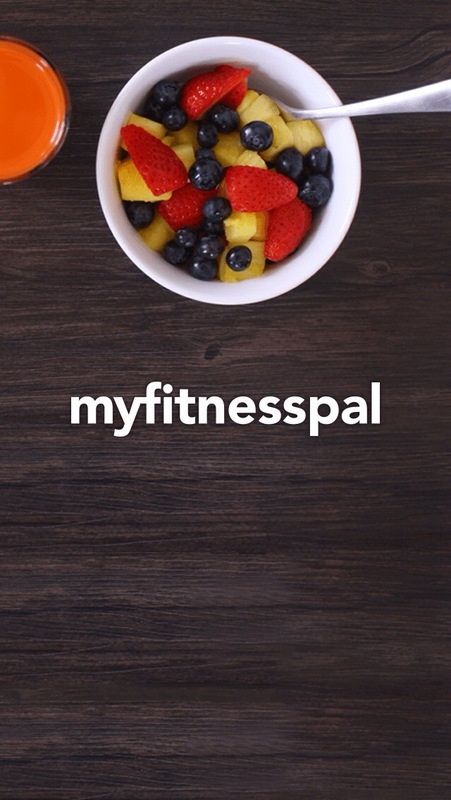 If you want to lose weight or even maintain your current weight, tracking your calories is a sure-fire way to do it and MyFitnessPal makes it easy. Now that I’ve reached my goal weight, I need to maintain it at that level. 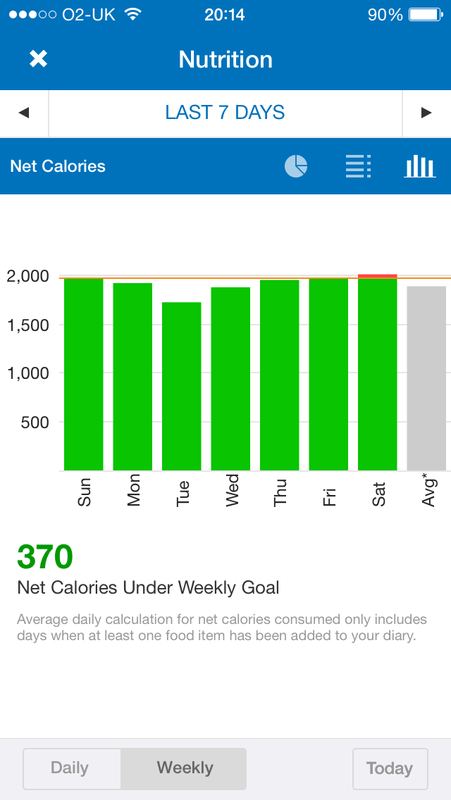 I’m using MyFitnessPal and will continue to track all my calories and adjust my daily allowance as necessary to keep between 12st 4lbs and 12st 6lbs. Some might ask why I wanted to lose weight when my lifestyle is pretty active. Firstly, even when being active 5 times a week, I had a 40 inch waist and that wasn’t good (it’s currently 37 inches!) 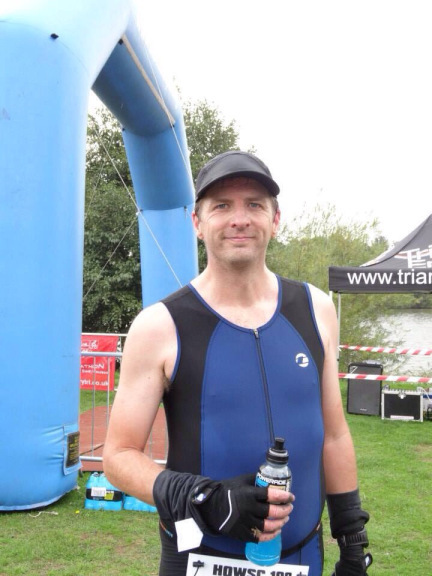 I don’t want to be looking like the photo below the next time I wear a tri-suit! Also, the more excess weight I’m carrying, the more I need to lug around whilst running and doing other exercise thereby increasing the demands on my body and heart. 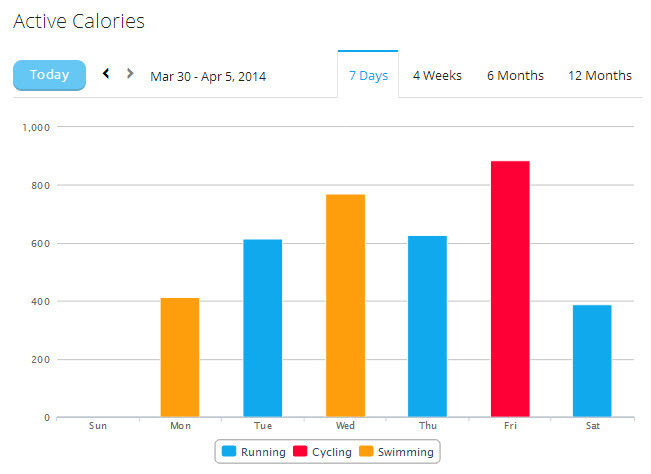 By losing weight, I’m reducing those demands and reducing the likelihood of injury. Losing weight should also help make me quicker when running, cycling and swimming. My optimal racing weight according to this Racing Weight calculator is 156lbs (11st 2lbs or 71kg) which is a long way off my current weight. I think that’s completely unrealistic and I wouldn’t feel comfortable being so skinny at all (I was that weight as a teenager once up on a time though). It would be great to get more toned which I’m sure swimming will help with. Last training day of the week and the decision was between a parkrun or STC swim. The latter was the chosen activity as I’d missed it for a few weeks. The session was coached by Kathy and was very good. However, I can’t really tell you how I did quantitatively as when I went to turn on my Garmin, it gave a long beep and wouldn’t come to life. It appears that trying to charge it from a PC that’s not turned on isn’t the cleverest way! Darn! Having said that, it was nice to not have to worry about starting and stopping the watch after every set. Would have oved to have had a SwimTag to fall back on. Never mind. The other set I recall was a 400m effort. This wasn’t done at race pace but a comfortably fast pace. I stroke counted for 4 or 5 of the lengths (between 22 and 24). Fortunately, Julian was wearing his Garmin so at the end of the set, as I had been in his tail, I asked what he’d done it in. 7:43. BOOM! Another great swim session with Southampton Tri Club. Taking part in their regular sessions has really transformed by swim performances from having been on a plateau. I know that I have a long way to go but I’m confident that with STC swim sessions 2-3 times a week, I’ll improve my efficiency and speed over the coming months. 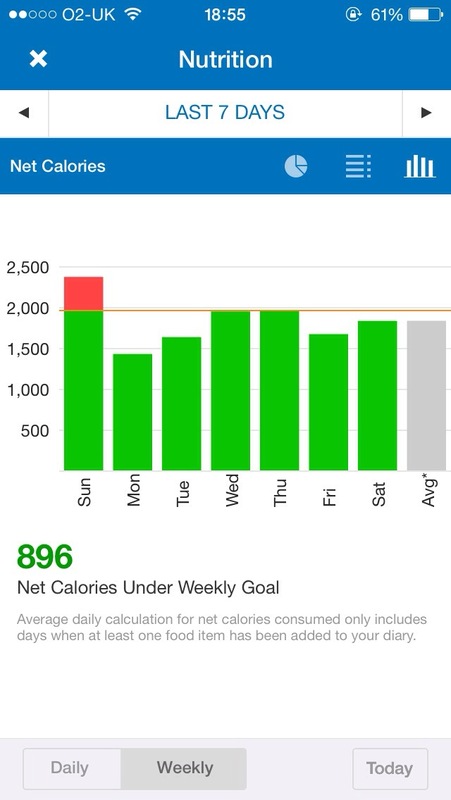 I’m not eating anything different but just counting every calorie and doing all I can to stick to my daily target. Overall, a good week training-wise. Monday was STC swim which went fairly well. Tomorrow (Sunday) is likely to be a rest day! 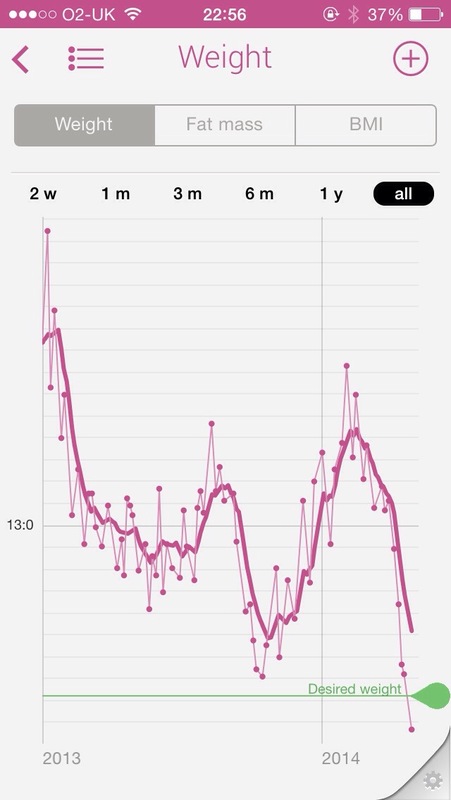 On the 29th, I weighed 13 stone 1.1 lbs. 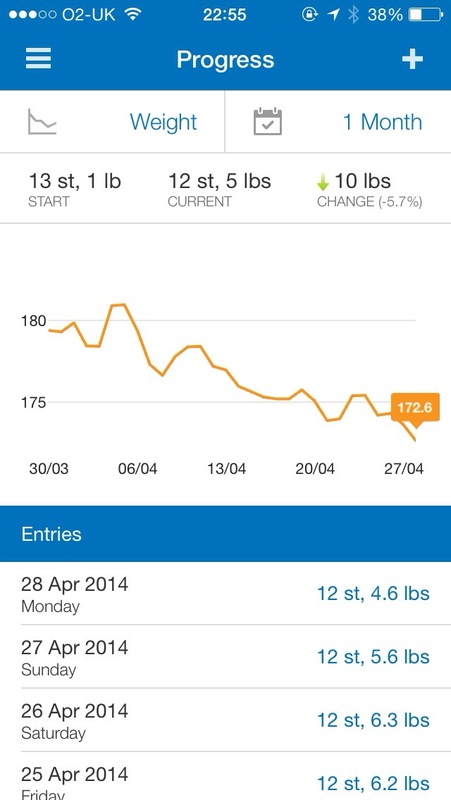 Today, I weighed 12 stone 12.9lbs. So, all in all, a great week.